Gianni Giulietti, der offizielle Dolmetscher von Giovanni Trapattoni über sein Verhältnis zu „Trap“ und wie wichtig Sprachen im Fussball sind, wenn sich die Teams aus verschiedensten Nationalitäten zusammensetzen. Gianni Giulietti, the official interpreter of Giovanni Trapattoni speaks about his relation to „Trap“ and on how important languages are in football, as teams are composed by players ofdifferent nationalities. What does a “football attaché” do? The British Vice-Consul and official football attaché in Austria, Adam Radcliff (just involved in German language course) answers this and other questions. Der Britische Vizekonsul und offizieller britischer Fussballattaché zur EURO 08 in Österreich, Adam Radcliff beantwortet uns diese und andere Fragen. [lang_sl]Intervju z Matjazem Kekom, aktualnim selektorjem slovenske nogometne reprezentance, večkratnim slovenskim državnim prvakom v vlogi igralca in trenerja, bivšim slovenskim reprezentantom, kapetanom različnih ekip, selektorjem mladinskih državnih selekcij… – človekom, ki je svet nogometa prepotoval podolgem in počez. Koliko so ga različne vloge zaznamovale kot človeka in osebnost? Kako se je skozi ves ta čas spreminjalo njegovo dojemanje timskega duha? Kolikšnega pomena je v karieri poklicnega nogometaša komunikacija in znanje tujih jezikov? … present coach of slovenian national squad, multiple champ of slovenian national championship as a player and as a coach as well, former member of slovenian national team, captain of more squads, coach of slovenian youth selections… – a person who has travelled all around the football globe.How much all this roles marked his personality? [display_podcast][/lang_en][lang_de]…derzeitiger Trainer der Slowenischen Nationalmannschaft – als Spieler und Trainer mehrfacher Meister in der Slowenischen Meisterschaft, ehemaliger Slowenischer Nationalspieler, Kapitän zahlreicher Mannschaften und Trainer der Jugendauswahl: Ein Mann, der die Fußballwelt kennt. Wie haben all diese Rollen seine Persönlichkeit geprägt? Hat er die Geheimnisse des Teamgeists nach all den Jahren ergründet? Wie wichtig sind Kommunikation und Sprachkenntnisse für eine professionelle Fußballkarriere? Desno-krilni igralec je vsepovsod prinašalec uspeha. Osvojil je že toliko lovorik, da jih le še stežka šteje. Bil je tudi èlan slovenske in hrvaške nogometne reprezentance v èasu poosamosvojitvene zmede. Trenutno zaèenja svojo trenersko kariero. The right-wing player is a bearer of sucees. He won so many laurels, he hardly counts. 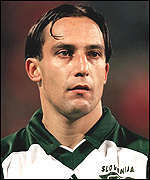 He was a member of Slovenian and also Croatian national football team in the time of after-independence confusement. Now he is starting a coaching career. Kapetan slovenske nogometne reprezentance na svetovnem prvenstvu na Japonskem in v Koreji leta 2002. Trenutno igra za Beigrad Ljubljana. 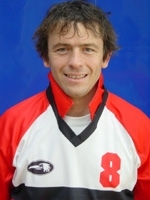 Captain of the Slovenian national Squad in World Championship 2002. He played for the Austrian teams GAK und LASK, now he plays for Bezigrad Olympija Lubliana.